If you’re coming to our annual conference and awards in two weeks, here’s a little more detail about what is happening on the day and who is speaking. On Saturday 10th September we’ll be learning about building your brand, improving the SEO of your blog, increasing your money knowledge and much more during the day. You’ll also have plenty of opportunities to ask your own questions – and of course to chat to each other! All this information, any updates, and more can be found on the app which is now available to download from Guidebook. It’s free and will work on iOS and Android. You’ll need to enter the passphrase shomo. 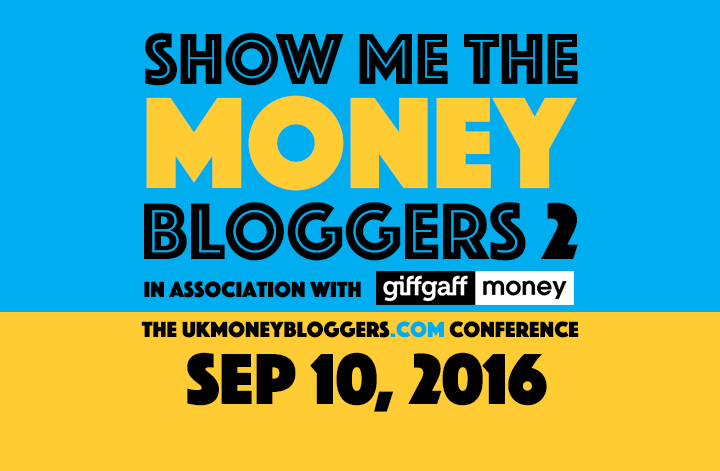 If you’re an independent money blogger, tickets are still available from Eventbrite. Get settled in, grab a pastry and say hello to your fellow bloggers. A run through the day with your host Andy Webb from Be Clever With Your Cash and UK Money Bloggers. Building an industry-leading community approach in business requires a certain sort of commitment, mindset and culture. giffgaff will talk to us about how they generated a highly engaged, powerful community-driven brand and the learnings gained in the process. For everyone who aspires to building blogs and writing to engage an audience, this will be a masterclass. giffgaff money is a facilitator. A helping hand to connect millennials with the experience and know-how of their financially savvy peers. Our ambition is to become the trusted financial facilitator for ‘generation rent’ by connecting them to the best knowledge, providing them with tools and giving them access to the right products. Content is what we live for. And we’d like to take you on that journey with us. Learn how to work with PR agencies and brands. Become their favourite blogger and default go-to. Discover how they work, what they look for, and how best to approach them. Previously, Tom worked at Blue Rubicon, the #1 rated PR Agency in the UK. He worked with bloggers for brands such as Sainsbury’s, McDonald’s and Cancer Research. He’s also published two number-one Amazon best sellers and, if you Google it, is “the sexiest man in Britain”. Faith is an award-winning money journalist, previously deputy personal finance editor at The Daily Telegraph. Faith also blogs at Much More With Less, about moving to the country, living on less and making the most of it. Redirects? Disavows? Find out what staff at SEO agencies really think about some of the confusing search related questions that have been asked about on the UKMB forum. Karyn Fleeting is best known as the blogger Miss Thrifty. She is also Head of Content at MediaCom North, and a speaker at digital and search conferences in the UK and USA. Her personal finance blog launched in 2008 and has been named one of The Times’ ’50 Top Websites to Save You Money.’ The Miss Thrifty Blog has won awards including the Plutus Award for Best International Personal Finance Blog, plus a Cosmopolitan Blog Award for Lifestyle Blog of the Year. Pinterest is great when you’re after inspiration for dinner, you’re planning a wedding or need some help with a craft project, but you can get a whole log more from it as a blogger. Pinterest is widely known as the image search engine and has a highly engaged user base. Naomi Willis is the Managing Editor at skintdad.co.uk. She supports with content creation, planning and organisation as well as social media strategy. She has a background in HR and loves all things Michael Jackson. referral traffic. Sandwiches provided by giffgaff money, and some extra surprises from Approved Food. ApprovedFood.co.uk is the UK’s largest online retailer of clearance food and drink. Products for sale include those that are nearing or past their best before date, surplus stock, or are in outdated packaging, giving their customers savings of up to 70% on the RRP. Registration takes a matter of minutes and is open to everyone, meaning thousands of great bargains are just a few clicks away! The UK Money Blogger community is almost a year old and it’s been a fantastic 12 months. But what next? Plus a conversation about what is fair pay for money bloggers. Emma Bradley is a writer, teacher, public speaker and also the editor at Tots 100 I have been blogging for six years and full time for two. Amy Rowe is a senior consultant at a financial PR agency called MRM. She is also editor of the personal finance website Mouthy Money and, as part of her job, manages a team of bloggers. We’re talking a lot about blogging today, and not so much about money! So this is our Money Talk – I’ve invited Vanguard to give us the low down on what investing is and how it works. Vanguard is a leading provider of high-value investment services, whose mission is to help clients achieve their goals by being one of the world’s highest value providers of investment products and services. Since establishing the first indexed mutual fund in the U.S. in 1976, The Vanguard Group Inc., has grown into one of the world’s largest and most respected investment management companies. As at 31 July 2016, The Vanguard Group managed over US$ 3.6 trillion in assets worldwide, making it one of the world’s largest investment management companies. 3.35pm: Dragons Den secrets – Deepak reveals all! You’ll probably know Deepak from the UKMB Facebook group, but did you see him face the Dragons in January? He’ll be sharing his experiences and what happened next. Plus some thoughts on whether getting investment for your blog is a good idea. Deepak Tailor is the founder of the UK’s largest freebie site, LatestFreeStuff.co.uk. It’s updated everyday with new freebies, samples, free stuff and competitions. The website now attracts over 500,000 visitors a month and this year was featured on the BBC show ‘Dragons Den’. He has big plans to keep expanding and growing the website as well as creating new partnerships with the MoneyBlogger community. Join Affiliate Window and bloggers to find out the tricks to get the best from the networks, and how to get your readers to click. Ian works in the Publisher Services Team at Affiliate Window helping new websites, technologies and apps develop in the affiliate space. With previous experience managing multiple affiliate programmes, including Topman and Waitrose, Ian now uses the insights he has picked up from working with brands to help new propositions grow and make the most of affiliate marketing. Emma Drew runs From Aldi To Harrods, where she blogs about saving money and making money. At last year’s Show Me The Money Bloggers conference she decided to leave her day job and hasn’t looked back since. Every month she makes the brave decision to write her income reports to let everyone see exactly how much money she has made from blogging and side hustles. As we close the conference, it’s time to pick up your goody bags, with much of the contents secured by Emma Drew (From Aldi to Harrods). While we get ready for the SHO-MOs, join Deepak, Tom and the team to celebrate the imminent launch of Latest Deals with some tea and cake. Twelve awards are going to be presented over this 90 minutes. More details and the running order will be on the app. We’ll have been joined at the awards by many of the judges and awards sponsors – who are all there to meet you! It’s a great opportunity to make some contacts, and chat more with your fellow bloggers. For anyone wanting to carry on, we’ve reserved some space at the Slug and Lettuce pub around the corner.